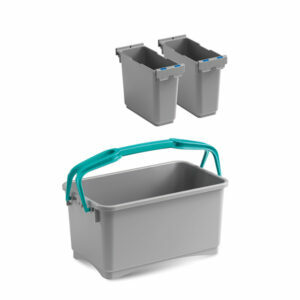 Eroy is a multi-purpose bucket that is modular and compact. Ideal for small to medium sized areas. Use for floor and surface cleaning. The double snap together handle holds tools in place during transport. Cleaners will love its versatility and quality. 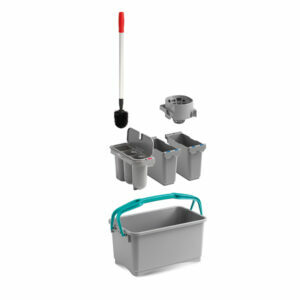 Eroy is a multi-purpose bucket that is modular and compact. Ideal for small to medium sized areas. Use for floor and surface cleaning. The double snap together handle holds tools in place during transport.There are many configurations and accessories available for the Eroy system please ask your sales representative for more information. Eroy is a multi-purpose bucket that is modular and compact. Ideal for small to medium sized areas. Use for floor and surface cleaning. The double snap together handle holds tools in place during transport. 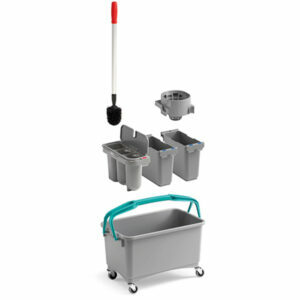 With the wheel makes it easy to transport as the bucket can be pushed along the floor effortlessly.There are many configurations and accessories available for the Eroy system please ask your sales representative for more information. Eroy is a multi-purpose bucket that is modular and compact. Ideal for small to medium sized areas. Ideal Use for floor and surface cleaning. The double snap together handle holds tools in place during transport and makes easy to carry.There are many configurations and accessories available for the Eroy system please ask your sales representative for more information.